Antique brass floor registers have a solid brass core construction. These air vents have a plated antique brass finish for that old world look. The antique brass floor registers feature an elegant diamond design which is named Strathmore by Hamilton Sinkler. We have air vents available in 9 sizes, all which are listed below. When ordering the antique brass floor registers, be sure to order them according to the opening size of the hole in the floor and not by the measurement of an existing grille. Our air vents have a metal damper attached to the back of the faceplate. Open and close the antique brass floor registers damper to control your homes airflow. Installation of the air vents is quite quick since it only involves dropping the register into the floor opening. Note: The Hamilton Sinkler air vents will take approximately 10-12 weeks to ship from the manufacturer once payment has been received. Tip: To correctly order the antique brass floor registers, measure only the opening in the floor. The 6 x 10 air vents will fit into a 6 x 10 floor opening. Antique brass floor registers faceplate dimensions will be approximately 1 1/2" larger than listed hole size. 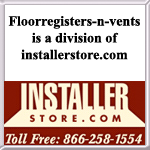 Check out air vents in other styles or different finishes by browsing our floor register section. Order matching antique brass wall registers to synchronize your style throughout your home. Our Strathmore antique brass floor registers will become your homes signature look. Place your order today.